Rich purple-pink semi-double flowers, 5cm deep (2 in). A seedling from cl. alpina 'Ruby' raised by Kathleen Goodman and introduced by Raymond Evison. 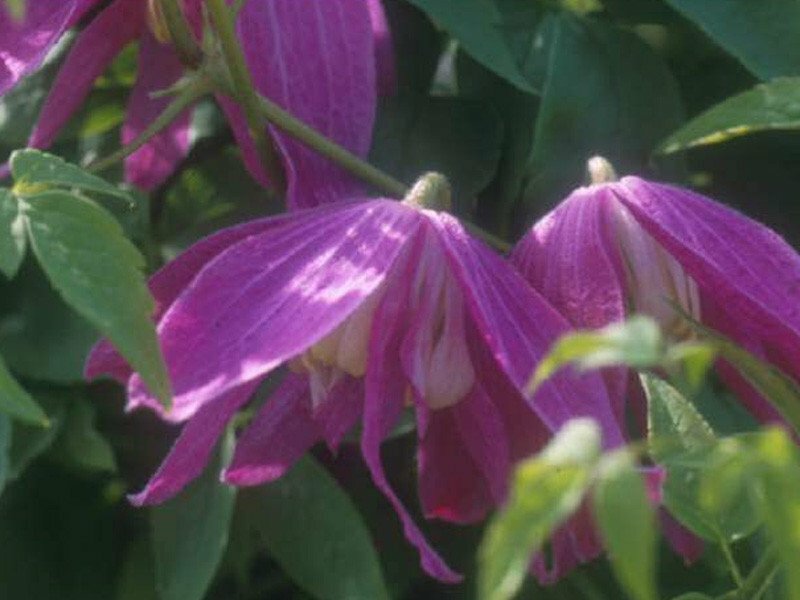 A free flowering plant which is a great improvement on its parent. The alpina species has given rise to a range of different coloured cultivars from white, pink, mauve, blue and purple in colour, some becoming semi-double as those of macropetala. This group are most winter hardy and extremely valuable as garden plants. They can be used to grow along with other wall trained shrubs, such as chaenomeles, on north facing walls to give added colour and interest in mid to late spring. Due to their winter hardiness they can be trained to grow on low fences, low walls, on poles and uprights to pergolas, on very exposed locations. They are winter hardy to -35°C (-31°F).